Doctor Who: Big Finish - MASK OF TRAGEDY Review | Warped Factor - Words in the Key of Geek. Tony Fyler gets his Greek on. 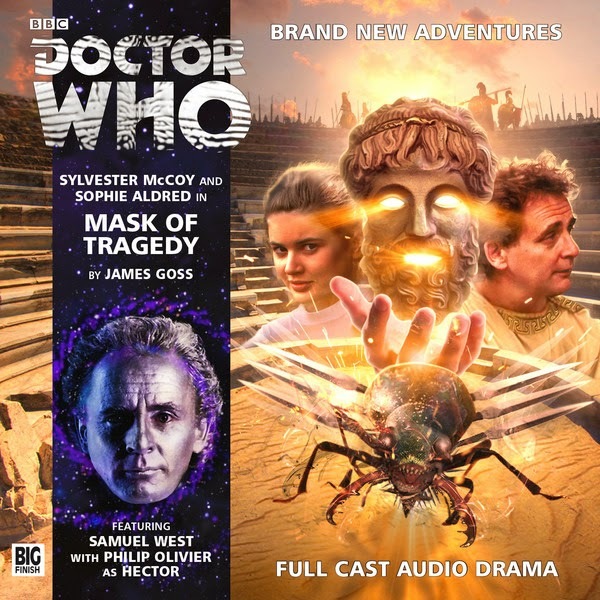 Mask of Tragedy is, above all and with a perversity that will appeal to most Big Finish fans, a comedy. It’s a Seventh Doctor story, so of course it’s a comedy dark enough to have been born in the heart of a black hole, but still, if it’s not trying to be funny, then something somewhere has gone staggeringly wrong. The Doctor takes Ace and particularly Hector, who’s still recovering from having the chasm in his mind filled up with the Nucleus of the Swarm, for a bit of a holiday, to ancient Athens. Proving that in the home of theatre, everyone’s a critic, as well as harking back to the days of the First Doctor, Dodo and Steven, neither Ace nor Hector seem particularly impressed – not even when it turns out that the Athenians know all about aliens, and in fact run (almost Navarino-style) tours of the wonder that is Athens for the fairly constant influx of aliens who come to gaze upon its majesty. The majesty, as far as Ace is concerned, means being allowed to do ‘naff-all’ – not act in the theatre, not even go to the theatre, not be able to walk five steps without getting up the nose of the paranoic King Cleon, and not, as it turns out save herself from being expelled from the city and left at the mercy of the Spartan army camped outside, preparing to come in and sack the place to within an inch of its cultivated life. One alien visitor in particular is causing a bit of an accidental ruckuss (as you tend to do when you look like a massive flying beetle), which is why Tyrgius the beetle-man from outer space uses a mask – widely mistaken for the Mask of Dionysus (god of joy and partying, essentially), but really a piece of alien tech that makes humans suggestible, so they see him as an almost insanely beautiful young Athenian swain. Meanwhile the Doctor pops in to pay the money he owes to Aristophanes, ye olde playwright, who here is notte-so-olde-at-all, and played (by Samuel West, no less) as a kind of rock and roll Giles from Buffy the Vampire Slayer. An old friend of the Doctor’s and a merciless satirist of poor, increasingly unhinged King Cleon, Aristophanes is an island of sanity in an Athens going mad – a sickness turns men into harmless zombies, Tyrgius the beetle flies about the place being taken for a Fury, the Mask (thank you, Jim Carrey) makes its wearer feel like the god Dionysus and start strutting about the place imposing their will on the suggestible populace, giving Hector actor Philip Olivier his second chance in two stories to do some classic ‘possessed’ acting. Oh and there’s the really rubbish dancing girls. No-one expects the really rubbish dancing girls. If you take one thing away from Mask of Tragedy, remember this – do not mess with the really rubbish dancing girls. 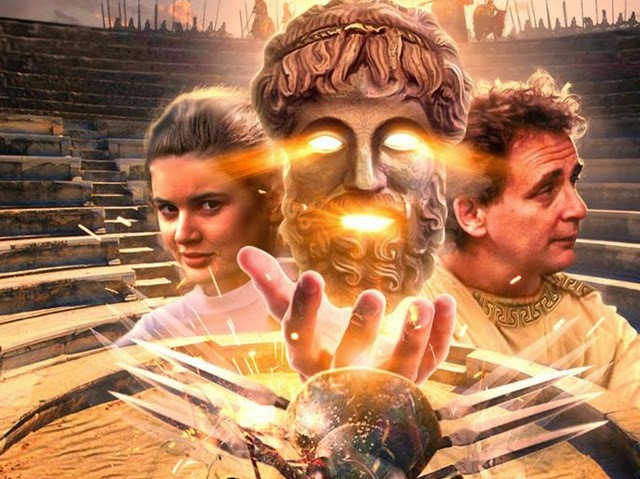 For a story set in ancient Athens, and particularly one that centres its action on the theatre of ancient Athens, it’s pleasing to find that Mask of Tragedy all hangs on a Deus Ex Machina, and it’s a couple of hours of enjoyable knockabout fun from author James Goss. But Mask of Tragedy, for all it slips by quite amiably, is not perfect by any means. The tone is ambitious, channeling the Donald Cotton scripts of the 60s (The Myth Makers, The Romans, The Gunfighters) through a very modern, New Who sensibility (Athens being a temporal tourist spot, so the locals being au fait with aliens), with just a dash of Delta and the Bannermen to suggest this is a Sylvester McCoy story. All of which should be a godawful car crash, but really isn’t – the writing and performance behind Aristophanes being a big help in smoothing the story along. Such issues as there are with it really seem to be in the Doctor’s companions here. This feels and sounds like very young Ace, Sophie Aldred’s intonation and breeziness belonging squarely to the girl we met on IceWorld, rather than the woman who’s a seasoned veteran of time and space. In itself, that’s a nice surprise – it’s good to hear a glimpse of that young Ace again – but it does rather jar with where we are in her timestream, to the point where I’ve just spent around seventy words noticing it. Hector too feels like a character almost bogged down by his own backstory here – Hex, as he was, is always being thrown at him, and he spends a lot of time stropping off, demanding not to be compared to the man he has no memory of ever being – while seeming so very much like that man that it feels overplayed. Hector Thomas when he was first introduced as Hector Thomas was an intriguing character who’d learned to survive as himself. Here, he’s mostly Not-Hex, and this too feels, if not exactly jarring, then rather manufactured. This doesn’t help with the delivery of the denouement of the story, a kind of Steven Taylor stropfest where Hector turns on Ace and the Doctor, accusing them of treating history like a comedy, no matter who dies or who’s wounded along the way, no matter what the consequences of their interference is. It’s an accusation that’s been levelled at the Doctor before and it’s worked brilliantly, but you have to believe in the character who’s doing the accusing if you’re going to pull it off, and here, we more or less don’t. There’s a potential to Hector that was pretty much papered over in The Revenge of the Swarm, and that’s continued here. There’s plenty of ‘telling’ of who he is and what he’s been through, but not enough ‘showing’ of it in his own actions to convince. Despite the issues with the companions, yes, if you have £15 to spare (£13 on download), this is one to pick up. The threat’s not too threatening, but the period’s fun, the comic tone is delicious, the themes are well-delivered and the performance of Sam West as Aristophanes the unsuccessful comedian is a joy to listen to several times over. Pick up the Mask of Tragedy, and have a ball.